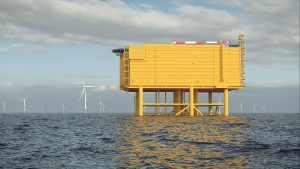 TenneT is set to deploy two 2GW direct current connections for the IJmuiden Ver offshore wind zone in the Netherlands, the first ever time this capacity is to be used. The connection will see two 525kV cables used, which allows lower costs, smaller space requirements and fewer routes on land, TenneT said. According to the transmission system operator, the offshore converters and turbines at IJmuiden Ver, located some 80km from the coast, will not be visible from land. BLIX Consultancy also deemed an island-hub network as technically and economically feasible, however it was concluded that it could not be operational in time. Namely, as the Dutch company said, the island-hub would take until 2028 to be constructed with risks of further delays and additional costs, which is not in line with the country’s 2030 wind energy roadmap. Ultimately, BLIX found that the direct current platforms with a 2GW capacity are the most attractive in terms of costs, risks and planning. “Building an innovative island-hub brings a greater uncertainty of delay in the planning phase then building a well-known direct current platform,” said Mark de la Vieter, Researcher of BLIX Consultancy. The 4GW IJmuiden Ver is one of three sites identified by the Dutch Offshore Wind Energy Roadmap 2030. The three sites have a combined capacity of 6.1GW and are expected to help the Netherlands reach the target of 11.5GW of offshore wind capacity by 2030. The wind farms at the sites are expected to be commissioned between 2024 and 2030.